A CHIP is a three-to-five year community-driven and action-oriented plan outlining our community’s health vision, values, and priority health issues. It seeks to improve the health of the community and explains how and by whom these issues will be addressed. The broader community holds collective ownership of the CHIP as well as responsibility for realizing CHIP goals. Why is SF creating a CHIP? Above all, SF is creating a CHIP to improve the health of its residents. The CHIP provides an opportunity for SF to create an innovative local model of community-centered health improvement that builds on our strong history of partnering with the community to identify priority health needs and improve population health. In addition, current national trends require stronger community partnerships, more coordinated health systems, an emphasis on prevention and wellbeing, and an expectation of better health outcomes for all populations. Help align the city’s many health improvement efforts. Fulfill national public health department accreditation requirements. Help SF non-profit hospitals meet state and national requirements. How will SF implement the CHIP? SF has adapted a nationally recognized model for community-driven strategic planning (Mobilizing for Action Through Planning and Partnerships (MAPP) process) for its CHIP-development framework. MAPP relies on data from a series of community health assessments to inform the final CHIP. MAPP complements SF’s strengths by building on existing efforts and strengthens community leadership, identifies a few key priorities, and emphasizes collective action and impact at both systems and community levels. More detailed information on the SF CHIP process can be found in the full report. 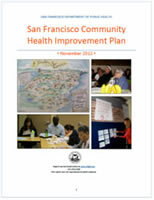 The following sections detail goals, objectives, indicators, and targets for San Francisco’s health priorities as well as strategies and community assets/resources aligned with each priority.